The data stored in enterprise systems is growing exponentially. According to IDC, the digital universe (all the digital data stored in all the systems in the world) is growing by 40 percent per year, doubling roughly every two years. And enterprises have liability or responsibility for 85 percent of that data. 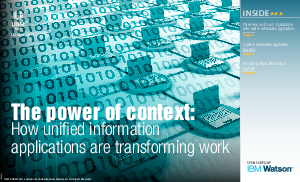 As data stores increase, it becomes increasingly difficult for knowledge workers to locate the information they need to do their jobs. To solve this problem, enterprises have invested in a range of applications, portals, and enterprise search tools. In fact, researchers say the market for enterprise search tools is likely to be worth $5.02 billion by 2020. However, despite these significant financial investments, the tools enterprises have aren’t always meeting the needs of workers.